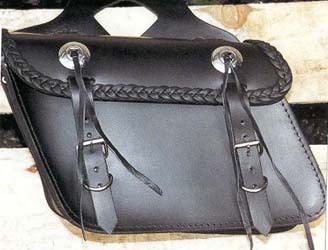 Medium sized saddlebag has braided leather trim around flaps. Cut outs in throwover center. This Black Motorcycle Bag features fringe, braid, medium size, and silver tone conchos.This a throw over bag. Sizes: 12- 1/2" x 9 1/2" x 4"